…I know too that the powerful fear art, whatever its form, when it does this, and that amongst the people such art sometimes runs like a rumour and a legend because it makes sense of what life's brutalities cannot, a sense that unites us, for it is inseparable from a justice at last. Art, when it functions like this, becomes a meeting-place of the invisible, the irreducible, the enduring, guts and honour. 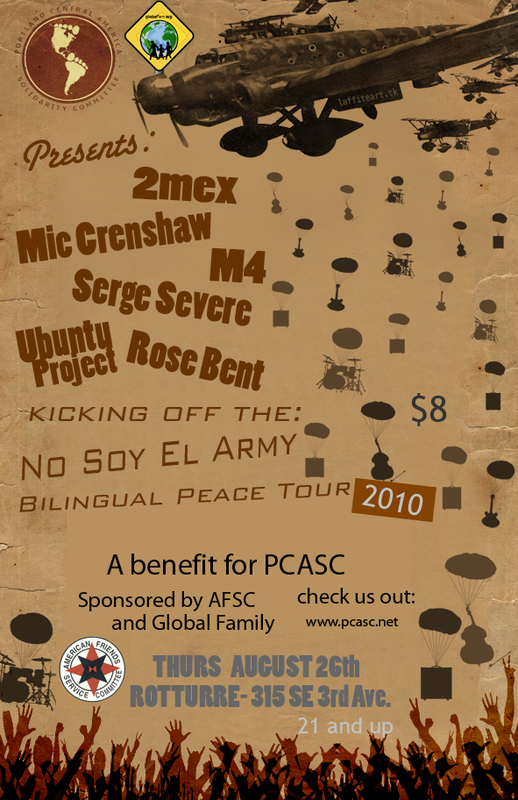 A night of music, consciousness, celebration, and support benefiting PCASC's anti-militarization work. Sponsored by AFSC and Global Fam. Paper tickets available at PCASC office @ 2249 E. Burnside St. Call 503-515-5456 to reserve.